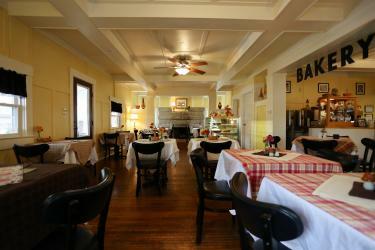 I’ve visited the Bread Basket Cafe and Bakery in Danville, Indiana, twice so far, and each time my meal and the overall environment inside left a distinct impression on me. So, I wanted to dig a little deeper on what makes this Hendricks County staple such a wonderful experience. Owned by mother and daughter duo Judy Sexton and Jinayla Bollman, the cafe is nestled inside a former bungalow two blocks east of Danville’s Historic Courthouse Square and is open for breakfast and lunch Tuesday through Saturday from 7:30 a.m. to 3 p.m.
A staple on the Rural Routes to Main Street Cultural Trail, the Bread Basket’s culinary offerings stand out as unique and delectable and are served up fresh every day. They source all the produce from local growers as much as possible. They even purchase their coffee beans and tea from Indiana farmers. On my most recent visit for breakfast, I ordered the omelets, which packed so much flavor. It felt wrong to eat it all in one sitting, but it’s also impossible not to. The toast on the side wasn’t just regular toast; you have options! They offer honey oat, wheat nut or a slice of specialty bread most days. You can’t choose poorly; the bread is baked fresh every day starting at 4 a.m.
Chicken salad croissant: This lunch dish comes with grapes, apples and toasted pecans in a homemade dressing. “That’s my own recipe that I have had since before the cafe opened,” Judy said. Ham and swiss sandwich – This grilled favorite is served with apricot preserves and whole grain mustard. 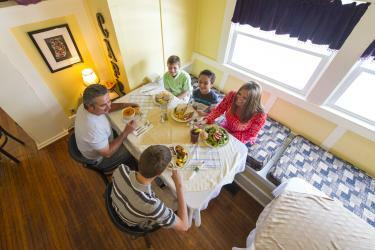 Salads – They serve the salads fresh with lettuce that is picked that day and garnished with the freshest vegetables. Coconut cream pie and peanut butter pie – These simple staples don’t need any explanations. Blackberry wine chocolate cake – This was actually made for Jinayla’s wedding. It’s a regular in the case at all times. Many recipes are Judy’s and Jinayla’s, but the staff has also contributed their ideas. The story of how the Bread Basket began happens to be just as charming as the cafe itself. Judy’s father owned a restaurant and taught her everything she knows from cooking to payroll to doing dishes. As she prayed about what to do once she finished raising her children, she said God made it clear to her she was supposed to open this restaurant. Indulge in breakfast during the week. The ladies told me lunch can be really crazy, so if you want a nice, leisurely meal, come around 9 or 10 a.m. when you will find a much more relaxed atmosphere. The restaurant&apos;s busiest times fall between 9 a.m. and 1 p.m. on Saturdays and noon to 2 p.m. the rest of the week. “We do not frown on dessert for breakfast,” Judy said. “We help you find excuses to eat our brownie waffle covered in chocolate and strawberries.” Aside from sweet breakfasts, the dessert case alone deserves time for careful perusal and choosing. You can even take a mini cake or pie home, endearingly called Baby Cakes and Sweetie Pies. 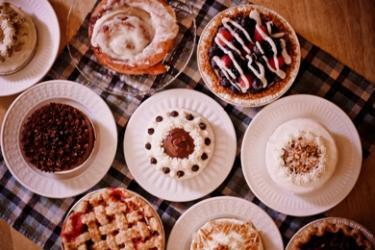 The Bread Basket is on Indiana Foodways&apos; Hoosier Pie Trail, named by Yelp as one of the Top Places to Eat in the Midwest, and is contacted often by the media, including a recent request from Midwest Living Magazine. What’s coming up for the Bread Basket? This summer, they will build and plant raised beds for a kitchen garden right outside their backdoor. Their 13th anniversary is in June, so come on out to enjoy one of our greatest local treasures.